Saigon has a place in modern memory for a number of reasons, but popular tourist destination is not likely the first that comes to mind. Tourist literature on the city nonetheless did exist from the earliest decades of the 20th century and continued to be produced throughout the tumultuous decades that followed. 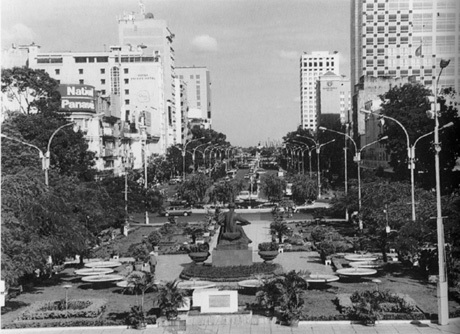 Capital of a controversial French colony, icon to a famous war, and host to a succession of political regimes, Saigon placed more than the usual burden on its guidebook writers. 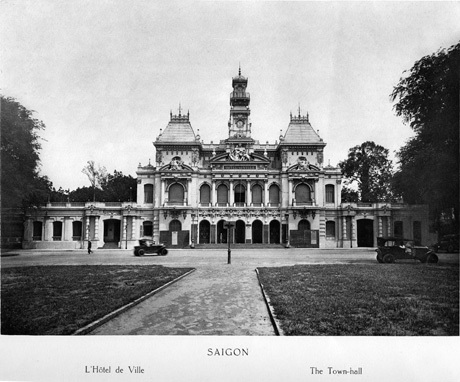 From its earliest incarnation in the 1920s, when anti-colonialist activities were already well publicized, Saigon’s touristic apparatus had to compete with other media—and later, with precedents in their own ranks—to render pleasure and coherence out of history and circumstance.A tour through this material would encounter three different visions of 20th-century Saigon/Ho Chi Minh City: a “timeless” city of Beaux-Arts—of classical monuments, promenades, and squares; a modern cosmopolis of bustling commerce, rich cultural collisions, and heady change; and a city defined in the community of its people. While these might seem to reflect three phases of change from 1900 to 2000, they also reappear in different formulations as three contestatory aspects of the city after 1945. Much is revealed of the political stakes involved in the way the guidebooks flaunt, suppress, or formulate the physical traces of French colonial power, the dynamism and fluidity of material and cultural change, and the diverse social and ethnic makeup of the city. What these tourist guides “saw,” did not see, and the geometry of their gazes can, in short, be read as urban constructions in their own right. Hotel-de-Ville. 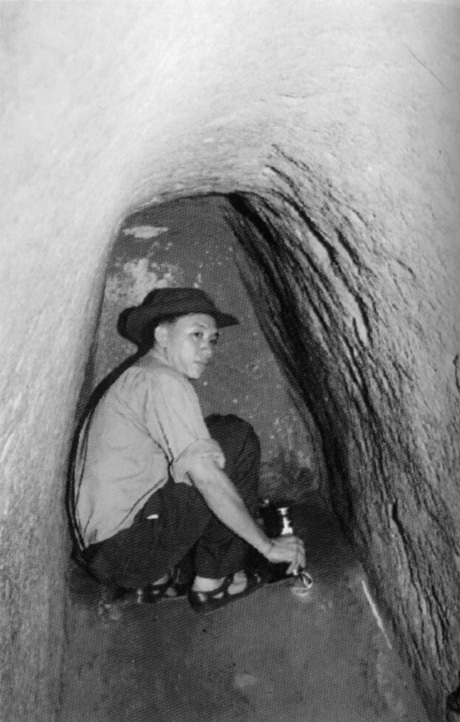 Image used in Tourist Guide of 1930. From Saigon (Edition Photo Nadal, 1930). Courtesy of Cornell University Libraries. Palais de Justice. From Saigon (Edition Photo Nadal, 1930). Courtesy of Cornell University Libraries. Municipal Theater. From Jacques Borge and Nicolas Viasnoff, Archives de l’Indochine (Paris: M. Trinckvel, c. 1955).THE PEARL OF THE ORIENTAs the port of entry for ocean journeys from Europe, Saigon appeared in many early guides to French Indochina. The focus of leisure travel to the region in the first decades of the 20th century was Angkor-Vat, the Khmer ruins that attracted much archaeological interest and preservation anxiety amongst Western visitors.1 What the Touring Club of France says about Saigon in its guide to Indochina is brief but emblematic: “Saigon first appears as a boundless park, which the gorgeousness of plant-life and the coloring of huge flowers help in stamping with a character of elegance over every other city in the Far East. A week can be pleasantly spent in Saigon. To be seen: General Government House, Government House, cathedral, Tomb of the Bishop of Adran, Theater, Inspection Tower.” Two early and enduring images of colonial Saigon are articulated here: the city as a garden, and the city of Beaux-Arts monuments. The rickshaw itinerary in The Tourist Guide to Saigon, Phnom-Penh, and Angkor (1930) gives a sense of the city’s attractions: the Boulevards Charner and Bonnard, the Halles Centrales, the Jardin de la Ville, the palaces of the Governor General and the Governor of Cochinchina, the Roman Catholic Cathedral, the Musée Blanchard de la Brosse, the Hôtels Majestic and de la Rotonde with the “delightful little open-air restaurant and bar,” the crowded Rue Catinat near the Mairie with its “art and curio, lace and silk shops.” The chief attractions in colonial Saigon for its principally French tourists were French works of architecture and urbanism. 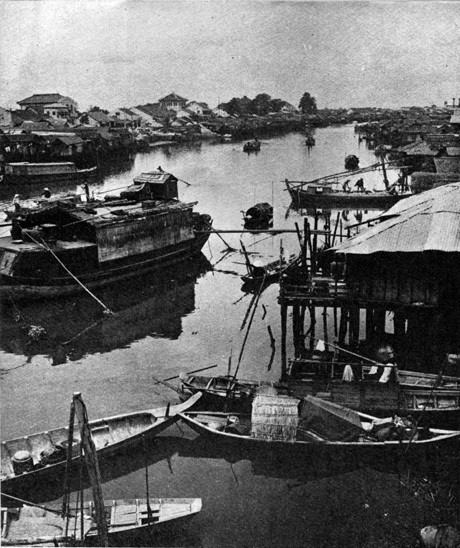 As the author of a 1934 guide puts it: Saigon, “capital of Cochinchina,” justifies the surname “Pearl of the Far Orient” with its “numerous edifices” and “beautiful order,” with the “neatness of its grand arterials” and “magnificent shades,” and with the “seductiveness and picturesqueness of the different quarters of the city.”Noticeably absent in these sightings are the local people. Their invisibility is perhaps most stark in The Tourist Guide, which establishes Saigon’s competitiveness as an international port city with evidence of its fast-growing population: 8,300 French civilians and “foreigners,” 90,000 Annamese and Chinese. There was, however, no shortage of “specimens of mankind” in guides and postcards to destinations outside of Saigon. The Touring Club’s guide lists “the prevalence of local color” as Indochina’s “first charm,” and offers sample illustrations of “Indo-Chinese Types” on its opening page. Visitors to the north supported a thriving market for postcards of bound, shot, or beheaded Tonkinese “pirates.” The Tourist Guiderecommends the mountain resort of Dalat, where the visitor may encounter a “tribe of aborigines… called ‘Moi’ by the natives,” and who “live in the forests and travel or hunt in whole family groups attired in Nature’s garb.” Distinct from Saigon’s urbanity, “their little hamlets or clusters of huts and miniature villages… resemble a mountain eagle’s nest at a distance.”Saigon’s allure, by contrast, manifested itself in scenes of incongruous familiarity: marvels of elegance and civility achieved in wilderness. 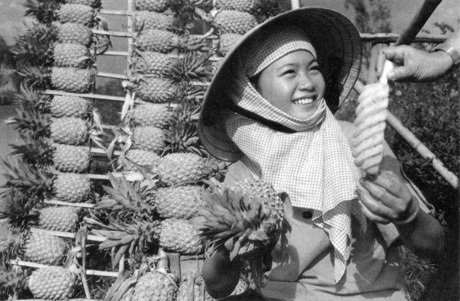 The images of Photo Nadal, widely circulated in government souvenir publications and guidebooks like The Tourist Guide, exemplify the specific quality of exoticism reserved for colonial Saigon. 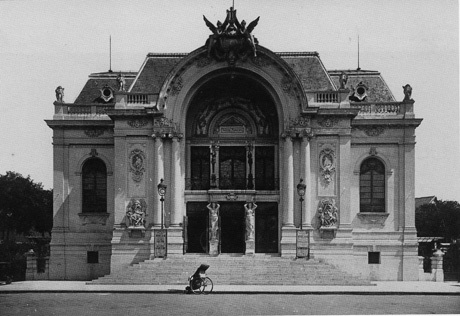 With their eye on the city’s Beaux-Arts buildings and parks, and their carefully staged rickshaw figures, these photographs give summary expression to the mission civilisatrice of the colonial project. The writer Jean Marquet articulated a common premise amongst his contemporaries when he wrote: “It is we the New Men who have drained the marshes, cleared the jungle…. It is we the New Men who have the passion and built the Cities.”2 The status of Saigon for its colonial builders was explicit: Architecture and urbanism, and the science of civilization supposed therein, was a gift of Modern Man to the colonized peoples. A number of topical images of the city coalesce here: Saigon as gateway to Indochina; Saigon as a garden, a work upon nature; Saigon as the Pearl of the Far East—an unexpected, marvelous oeuvre in the thick of raw, formless nature. above and following: From the American Women’s Association of Saigon,Saigon: A Booklet of Helpful Information for American in Vietnam (Saigon: United States Operations Mission to Vietnam, 1959). Courtesy of Cornell University Libraries. 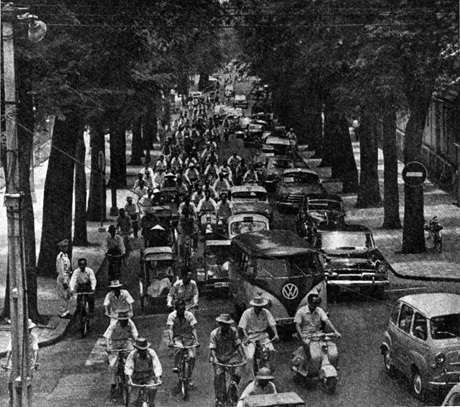 Rush hour traffic, Rue Pasteur.CITY ON WHEELSA rather different city emerges in the guidebooks for English-speaking readers put out by the new National Tourist Office of the first Republic of Vietnam (1955–1975). Saigon witnessed some of the most iconic events of the war during these two decades: brutal social and political repression under Ngo Dinh Diem’s presidency (1955–1963), the bombing of the presidential quarters in a failed coup attempt (1962), the self-immolation of Thich Quang Duc in protest against the treatment of Buddhists (1963), the assassination of Diem himself (1963), the arrival of the first US combat troops (1965), and the famous final withdrawal from the US embassy (1973). Like the proverbial “invisible elephant in the room,” these events only manifest themselves obliquely in the progressive city envisioned by its Vietnamese narrators.The readers of Saigon, Capital of Vietnam (after 1957), Saigon Roundup(1965), and Saigon (1967) will, indeed, find no section on history. “Saigon is a modern town.” The now iconic tree-lined boulevards and squares open onto another form of worldliness: “Saigon may compete with other big towns all over the world, with its sumptuous buildings, imposing palaces, and sky-scrapers.” Competitiveness in this realm is measured in speed: “Saigon is growing everyday. The changes are so fast that even the Saigon people are surprised.” With a population of two million “increasing everyday,” the city “grows in height as well as in width.” The “Pearl of the East, as it has been called by sea merchants from the Occident, is now growing and moving forward.” The itinerary to this heady city begins and ends on its avenues: Tu Do avenue, “lined with stores, restaurants, refreshment shops, movies… the rendez-vous of Saigon fashionable people;” Tran Hun Dao, a “picturesque sight… an endless stream of cars, taxis, buses, bicycles;” Cho Lon, the nocturnal “entertainment district,” “streaming with people” and “flooded with light from the brilliant shop-windows and the illuminated signs and advertisements.” Everywhere the “excitement of life bustling along with innumerable bicycles, pedicabs, cars and buses of every size and description.” Saigon is a “city on wheels.”The speed of movement is measured by the force of collisions. Saigon, “on its course to progress” is “the place where the Occident meets the Orient,” and the modern meets vestiges of “ancient times.” “Skyscrapers in the neighbourhood of curved roofed old pagodas, luxurious cars finding their way among simple horse carts, fashionable people walking between diligent laborers.” The sights of Saigon make a heterotopic list of scales and species, rendering the city in color, animation, and detail. Canaries, pigeons, monkeys, parrots, squirrels, rabbits, partridges, dogs, and fish in the Bird Market share the scene with gladioli, roses, mimosas, orchids, lotuses, and lilies in the Flower Market and lacquer work on Tu Do street, completing a tour of the Botanical Gardens, National Museum, and the Tomb of Marshal Le-Van-Duet. Saigon is “cosmopolitanism and bustling commotion” with an “asiatic flavour”—“a happy combination of old Oriental civilization and blooming modernism.”Food and people are ubiquitous in these Vietnamese guides. In Saigon, Capital of Vietnam, the one invokes the other, and both are indispensable to the vision of urbanity. Descriptions of food—at the market, on the street, in traditional festivals, at select restaurants—testify to Saigon’s diversity, worldliness, exoticism, and abundance. The Saigon guide not only lists extensive venues, but seduces with mouth-watering description. Firecrackers, feasts, festivals, and tales and legends punctuate the visual tour, and the visitor is frequently struck by the “warm hospitality of the Vietnamese people,” their “charm,” “friendliness,” and “easy-going manners.” The only “history” surfaces in occasional sections on the city’s urban and architectural monuments, where dates and biographical information on the French-built edifices and squares abound in instructive detail.HO CHI MINH’S CITYPreoccupied by post-war reconstruction and frontier skirmishes with the Khmer Rouge, Vietnam remained virtually closed to the western hemisphere for 10 years after the end of the civil war. Publications aimed at the English-speaking business traveler proliferated, however, following Hanoi’s easing of economic controls in 1986. Produced under an entirely new administration, official guidebooks to the newly renamed Ho Chi Minh City shared two aspects with their predecessors from Saigon’s National Tourist Association: a focus on the people of the city, and a preoccupation with the city’s temporal horizon.A pioneer in the genre set out what would become a common refrain in later guidebooks: “Ho Chi Minh City is a young city which came into being three centuries ago.” This seeming paradox closely follows another: the story of Ho Chi Minh City really begins in 1911, at the port of Saigon, from whence “the young patriot Nguyen Tat Thanh”—the city’s future namesake—set sail on a ship “in search [of] national salvation.”3 HCMC in a Nutshell (1985) opens by setting the record straight on history. Commemorating dates and names hitherto unknown in the West, the story’s ultimate hero is the people of Saigon, who “enjoyed independence and freedom for only 29 days” between the first days of colonial rule and the “liberation” of 1975. Standing firm in the face of hardships and sacrifice, “the first to fight but the last to enjoy the fruits of the revolution,” the people are the historical embodiment of the city from which Nguyen Tat Thanh set out on his quest and to which he returned as Ho Chi Minh. The paradox of a city that was “newly founded in the 17th century,” and named in 1975 for a story that begins in 1911 reveals its mythic logic here: Ho Chi Minh City is the narrative resolution of the city of Saigon.If Saigon is “a cradle of the Vietnamese revolution,” Ho Chi Minh City is the ideal socialist state: This city is defined by its institutions. In HCMC in a Nutshell, the magnitude of the people’s struggles and triumphs against “a war of aggression” and “multiform sabotage waged by the Peking expansionists in collusion with the US imperialists and their henchmen, the Pol Pot genocidal clique” is measured in numbers: 500,000 unemployed, 233,000 widows, 15,000 young hobos, 10,000 beggars; 2,500 doctors, 600 day-cares, 5,000 kindergarten teachers tending to over 30,000 children, and so on.A “center of international relations and tourism,” the city can accommodate “50 to 60 thousand tourists yearly.” For these visitors, HCMC in a Nutshellsets out the emblematic sights of the city: Nha Rong House on the Saigon River (former Messageries Maritimes building), built in 1863 but remembered for 5 June 1911; Thon Nhat Conference Hall, “headquarters of the Saigon regime” and the site on which the victory banner was raised to announce “the liberation of Saigon” and “the end of the rule of the US imperialists and their henchmen;” mangrove forests along the Saigon River that served as the “solid strongholds of the Revolution during the two Resistance Wars;” Cu Chi, “the Land of Steel” with its famous underground tunnels (“the enemy” called the latter “the ‘Red Capital’, the Communist ‘Sanctuary’ for it was like a sharp knife pointed at their heart”); the picturesque environs at Vung Tau, Nha Trang, Dalat… and the Ho Chi Minh trail.The visitor to Ho Chi Minh City (1990 ) would find many of these same scenes—and more. A “young” city that “came into existence in the 17th century,” a destiny launched in a 1911 voyage, Ho Chi Minh City is also “a metropolis of light and sound,” and a treasure trove of “beautiful tree-lined boulevards” and “elegant buildings from the colonial period.” The mythic heroism of the city of 1985 gives way at the end of the century to a narrative of pathos.Come to Ho Chi Minh City, a town endeared to the search of its identity. We are under no illusion it will be a fantastic tourist boom or we can provide you with the nicest tourist place in the region. Just come to see the changes that you can be bringing about. To make up for the lost time, we will spare no effort to give you a happy enjoyable and worthwhile stay in our beloved and beautiful city. Indeed we are currently in no position to compete with other countries about luxurious and first class facilities. But we also believe that visitors from the world over will remember us for our warm welcome, friendliness and hospitality. The city’s appeal speaks directly to the visitor. Its personification is “the spirit of the ‘Saigonese’”: as hosts, their warmth, good humor, perseverance—and poignant humility—will prevail over the brand of history. “Welcome to HCMC, with love!”“Time can do so much, but it can never change this very nature of this City.” In fact, however, time is the glass through which the visitor envisionsHo Chi Minh City. Rooted to the fabric of an imposed history, this city must be, on the one hand, perpetually “young”—a city of “youthful stamina” that “has never ceased to grow.” On the other hand, Ho Chi Minh City appears to the visitor in reflected light. “Many people… still remember that this City was once famous as the Pearl of the Far East. Its youthful charms attracted a great number of Western tourists in French colonial times.” The newly restored grand hotels “built during the French period” are now poised to revive “sweet memories of a ‘lost time’ to many Western visitors.” Ho Chi Minh City does not shy from stoking the ambers of nostalgia—a sign, perhaps, of successful “rejuvenation.”By contrast, the sights recommended by Ho Chi Minh City are not evocative, but informative. The tour of famous architectural and urban sites is an extensive itinerary that includes: the US Embassy, buildings “occupied” by Americans during the war that “naturally became targets of mission impossible type commando attacks,” the Cu Chi tunnel, the Iron Triangular, the mangrove forests (that “can revive some unpleasant memories of fatal supply missions along the Long Tau river”), and, “for visitors compassionate about the war effects on the Vietnamese society,” orphanages and Dignity Restoration schools, “where erred young ladies are given an opportunity to turn their lives over to a new leaf.” The guide makes pointed reference to the past lives of the city’s major monuments: the Ho Chi Minh Memorial’s previous incarnation as the Messageries Maritimes building; the Office of the People’s Committee as the former Hôtel de Ville; the Reunification Hall as former Independence Palace, which was in turn the Presidential Palace built on the razed grounds of the colonial Governor-General’s residence… While there are brief provisions for pleasure seekers in the tour, sightseeing in Ho Chi Minh City is a lesson in history—and a spectacle of temporal succession.The visitor sees double in Ho Chi Minh City—a guidebook published by the Saigon Tourist Association in Ho Chi Minh City. The specter of Saigon, Pearl of the East and metropolis of light and sound, shadows the Revolutionary City at every turn: “Saigon can reestablish its Westernized look almost overnight… HCMC is almost the only ‘cosmopolitan’ city of this country;” “the Saigonese themselves enjoy life as much as any other people on earth.HCMC is called a center of tourism.” For visitors, at least, Ho Chi Minh Cityshimmers like a mirage between two states of being. 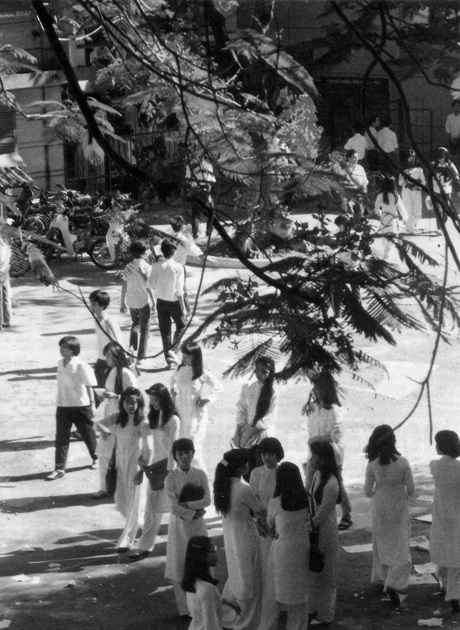 An iconic image to personify the ‘innocence’ and vitality of Saigon and the Saigonese. From Thanh pho HCM tu gioi thieu (HCMC: Nha xuat ban thong tin, 1992). A corner of Ho Chi Minh City. From Vietnam Tourist Guidebook (Hanoi, 2000). Girl with fruit. From Thanh pho HCM tu gioi thieu (HCMC: Nha xuat ban thong tin, 1992). See Panivong Norindr, Phantasmatic Indochina (Durham, NC : Duke University Press, 1996); Gwendolyn Wright, “Tradition in the Service of Modernity,” Journal of Modern History 59, no. 2 (1987), pp. 291–316, and The Politics of French Colonial Urbanism (Chicago: University of Chicago Press, 1991). French colonization of Indochina began with the 1859 capture of Gia Dinh fortress, located on the site of present-day Ho Chi Minh City. Saigon pre-existed French colonization as a thriving commercial town located in the area of present-day Cho Lon. The area developed by the French into colonial Saigon was itself a series of populous market towns under the Nguyen dynasty; the names of some of these—Ben Nghe, Ben Thanh, Gia Dinh—persist as local districts in the modern city. 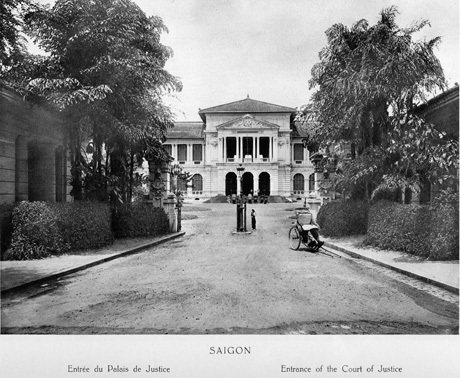 Cited in Philippe Franchini, “La cité blanche,” Saigon 1925–1945 (Paris: Editions Autrement, 1992), p. 31. 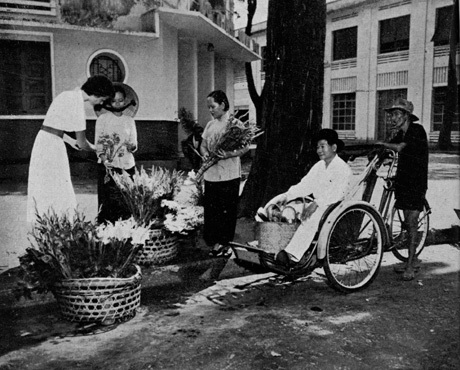 See Lily Chi, “Pearl of the Orient: Guidebooks and Colonial Saigon,” Architecture and Ideas 2.2 (Fall 2000). Nguyen, who later adopted the name Ho Chi Minh, traveled to France and America, amongst other destinations, to seek support from these governments for Vietnam’s independence movement. On collaborations between the US and Ho’s organizations before the defeat of the Japanese in WWII, see David Marr,Vietnam 1945 (Berkeley: University of California Press, 1995). See, for example, Robert Storey, Ho Chi Minh City (Saigon) (Hawthorn: Lonely Planet Publications, 1995); Richard Wely et al., Saigon Eternelle: Portrait d’une ville au passé toujours présent (Hong Kong: Editions d’Indochine, 1995); Peter Leonard, Saigon: a Guidebook (Vietnamerican Trading Co., 1995).